In 1974, the Assessment Authority Act was passed in the BC Legislature allowing the formation of the BC Assessment Authority, an organization which operates independently from municipal or provincial governments to assess property values for taxation purposes. Before this the Corporation of the Township of Richmond had its own tax assessors who created assessment rolls to establish property values in the Municipality. 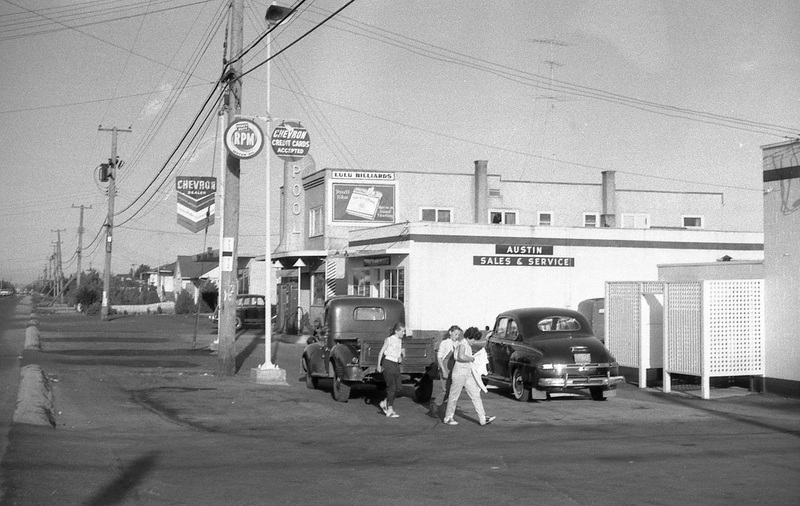 In 1958, an assessor took his camera out to document the commercial buildings along No. 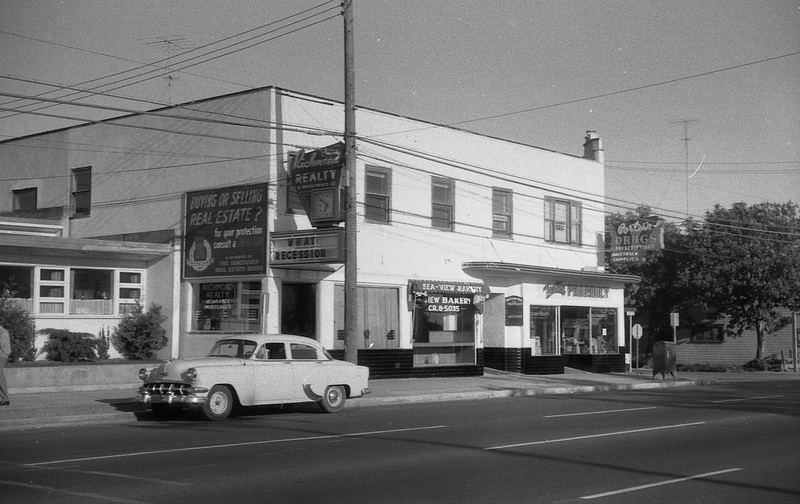 3 Road, mostly between its intersection with Westminster Highway and with Granville Avenue, and left us with a fascinating time warp back to the late 1950s in a location that has seen some of the greatest change in Richmond, although bits of it still survive. Lets take a stroll along No. 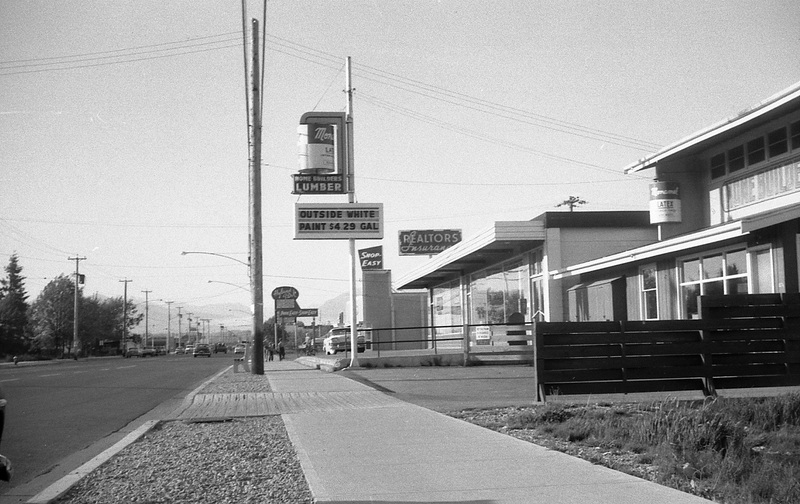 3 Road in 1958. The intersection of No. 3 Road and Westminster Highway looking north west. City of Richmond Archives photograph 1988 18 7. Starting our walk at the intersection of No. 3 Road and Westminster Highway, we look toward the north west corner and the new, modern supermarket of Canada Safeway and its parking lot. 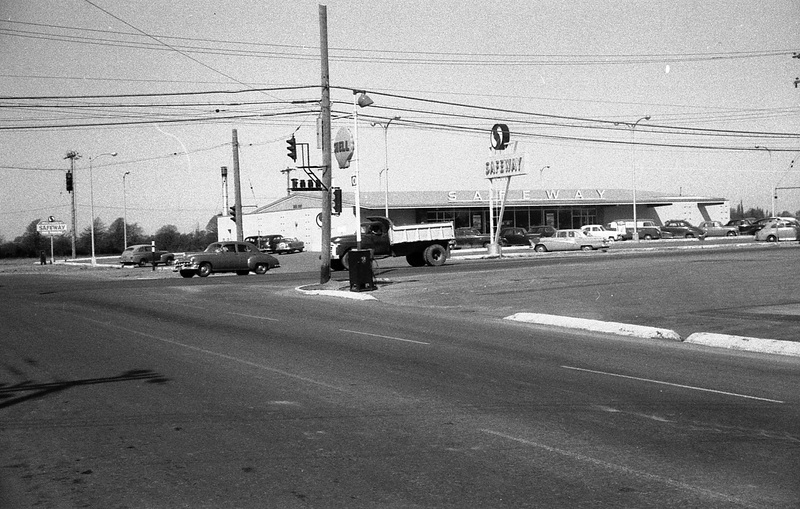 This intersection, one of the busiest in Richmond then and now, was one of the first to have a traffic signal. 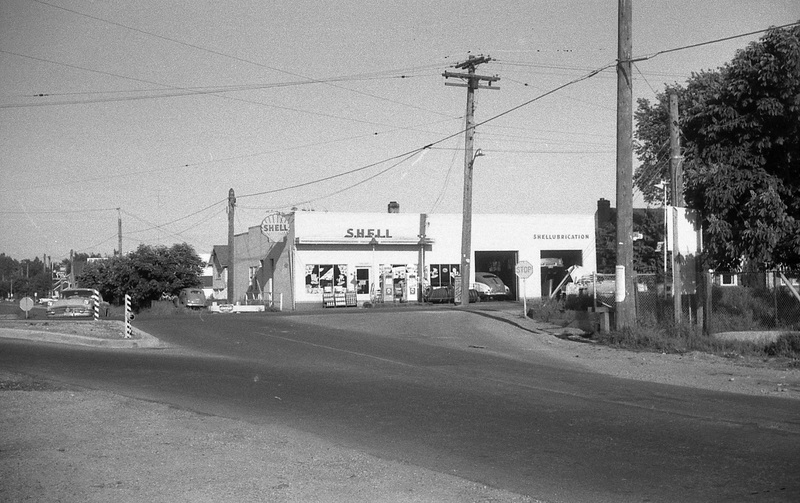 On the north east corner of the intersection was the Lansdowne Service Shell station. City of Richmond Archives photograph 1988 18 8. Across No. 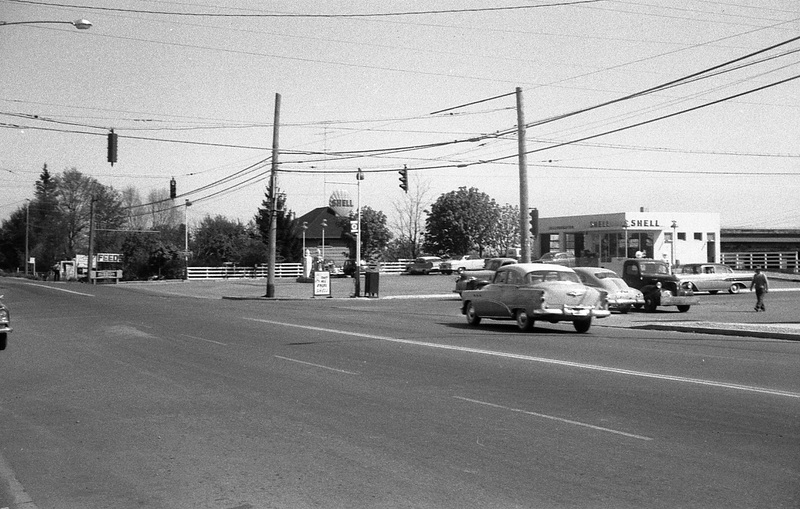 3 Road from Safeway is Lansdowne Service, a Shell gas and service station. If you drive north along No. 3 Road, there were only trees between the station and Lansdowne Park Racetrack. 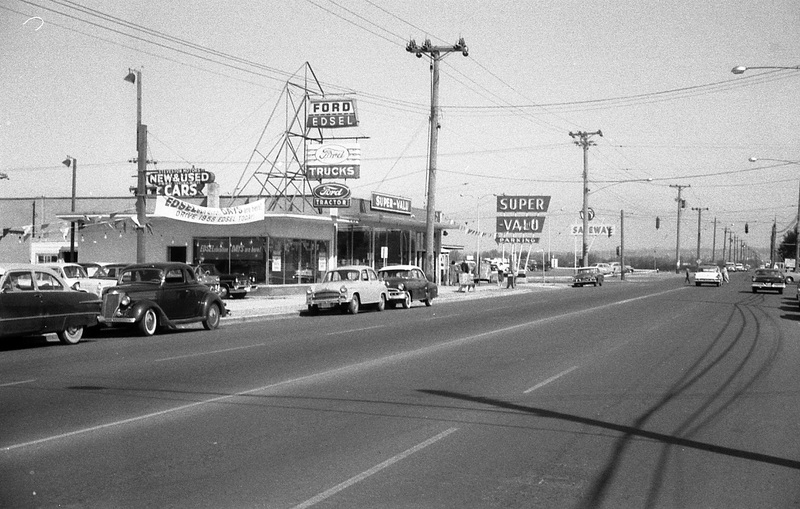 Directly across Westminster Highway from Safeway was the Super-Valu Store. City of Richmond Archives photograph 1988 18 9. 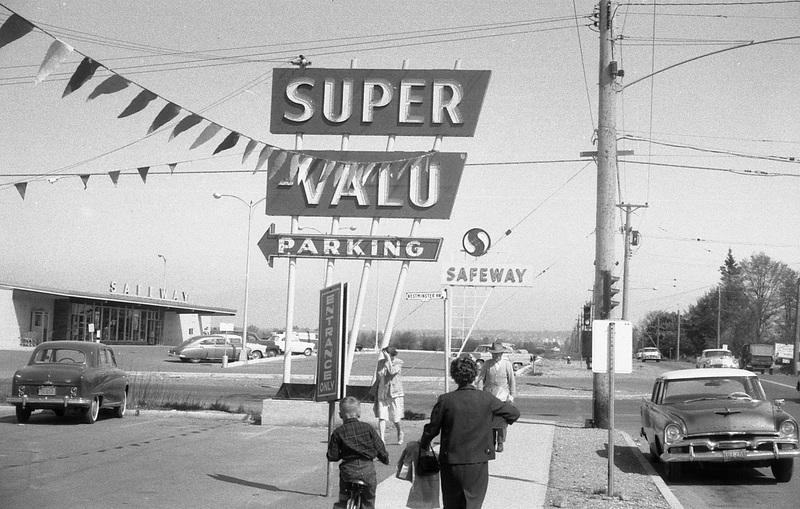 On the south west corner of the intersection, directly across the street from Safeway is its main competition, Super-Valu. Their signs compete for attention on this corner. Turning around and looking south up No. 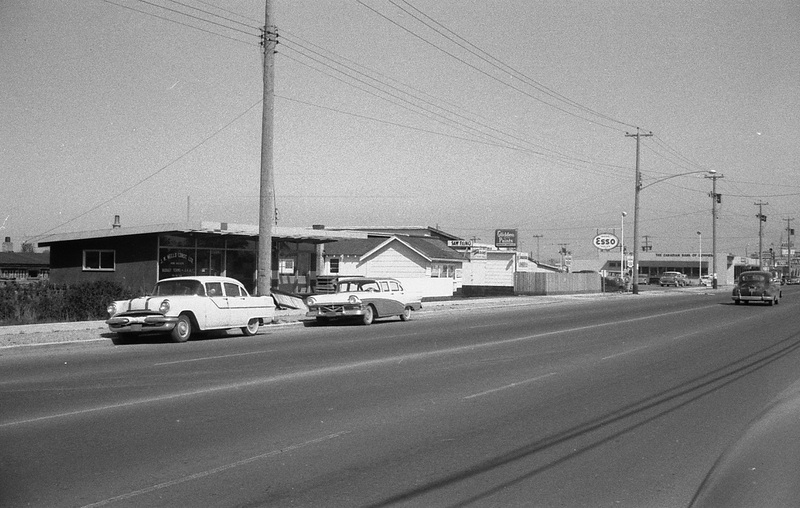 3 Road you can see the Ford dealership of Steveston Motors and the strip of commercial building an bit farther down. City of Richmond Archives photograph 1988 18 10. 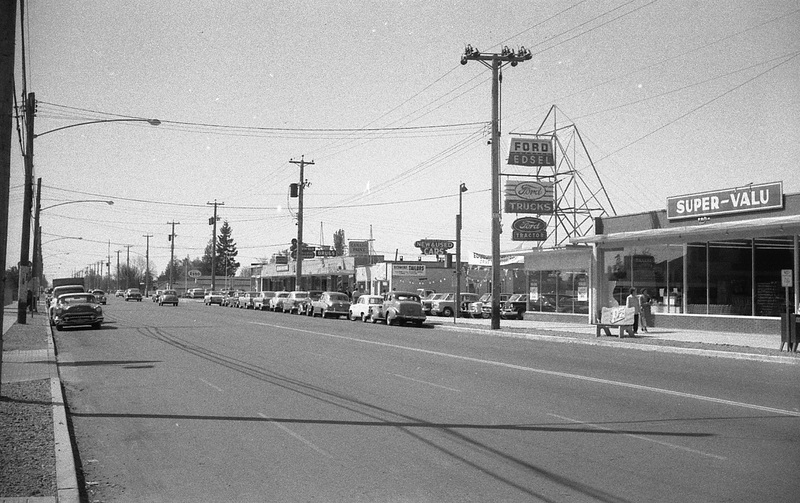 Standing in front of Super-Valu and looking south along No. 3 Road you can see some of the commercial buildings on the west side of the street. 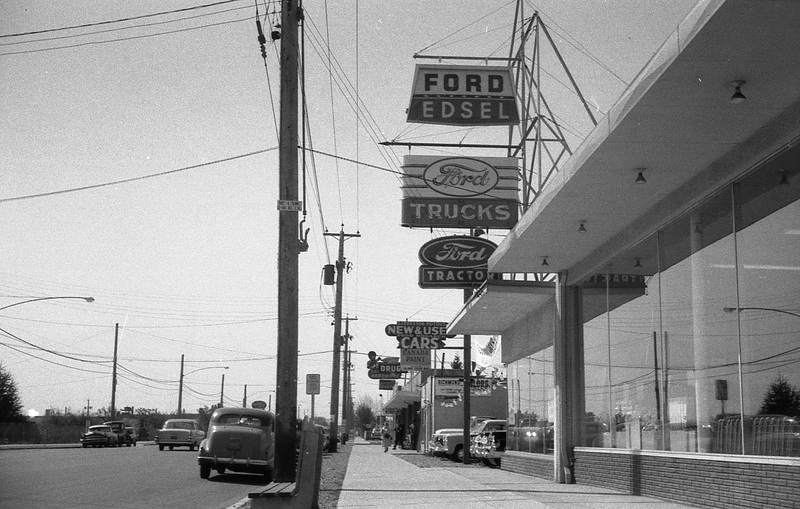 Steveston Motors Ford dealership was just south of the Super-Valu store. Across the opening to their car lot is a strip of storefronts. Looking south along No. 3 Road from the east side of the street. City of Richmond Archives photograph 1988 18 11. If you cross No. 3 Road to the east side and look south you get a good view of Super-Valu, Steveston Motors and the row of commercial buildings. Let’s walk along the sidewalk a bit…. Looking north toward Westminster Highway from the east side of No. 3 Road. City of Richmond Archives photograph 1988 18 6. 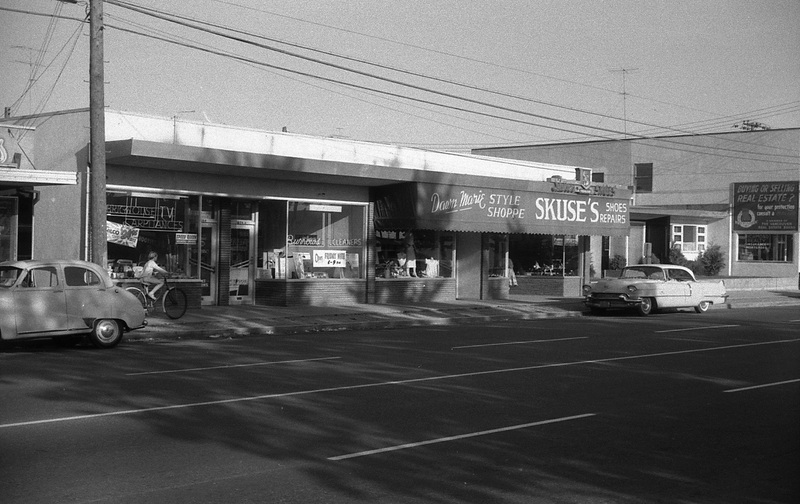 … and look north to see the businesses on the west side of the street, Safeway, Super-Valu and Steveston Motors. Judging by the banners and flags they’re really trying to sell those Edsels. Looking east along Westminster Highway from No. 3 Road. City of Richmond Archives photograph 1988 18 35. 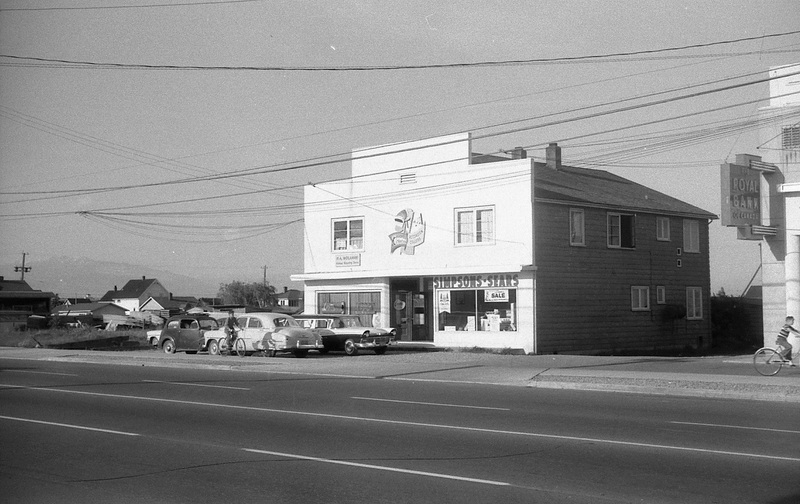 If we head back down to the intersection we can look east along Westminster Highway and see a couple of businesses just around the corner, Lulu Billiards and Jerry Pickard Motors Austin Sales and Service. 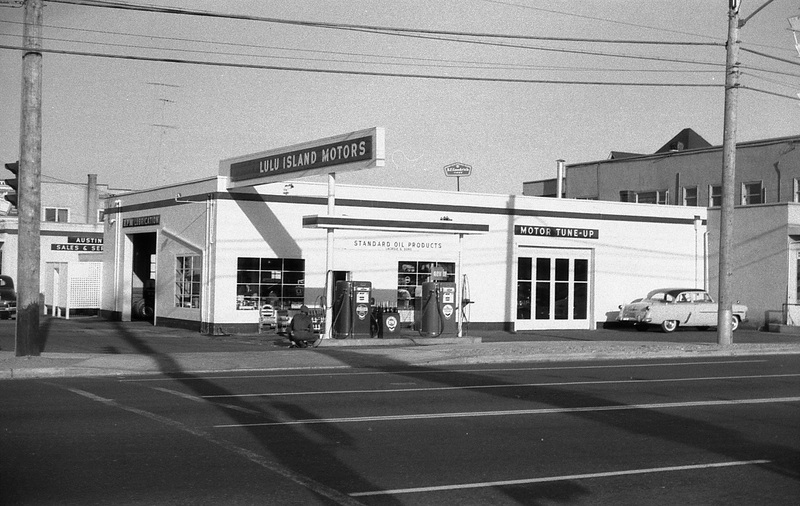 Lulu Island Motors on the coner of No. 3 Road and Westminster Highway. City of Richmond Archives photograph 1988 18 34. Right on the corner of Westminster Highway and No. 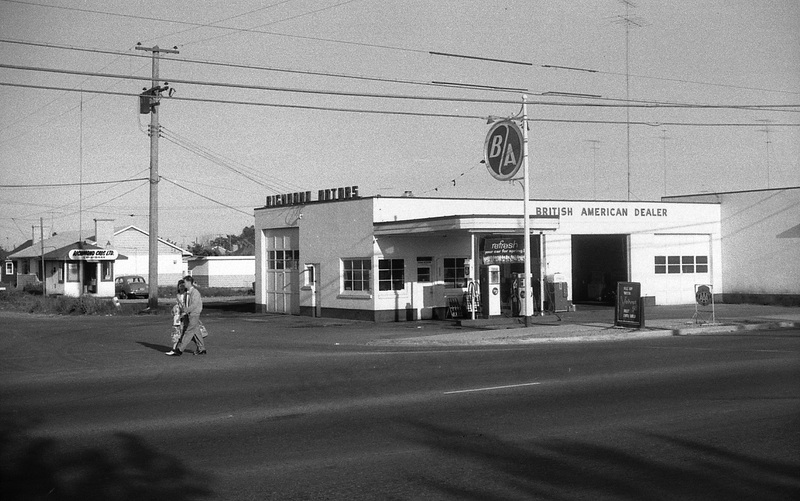 3 Road is Lulu Island Motors, a Standard Oil (Chevron) station where you can get gas, a tune-up and new tires. Looking farther south the next building houses a number of businesses. City of Richmond Archives photograph 1988 18 33. Next to Lulu Island Motors is a commercial building with a number of businesses. The Richmond Review Newspaper is through the first door at 604 No. 3 Road. Next door is the popular Rooster Cafe. 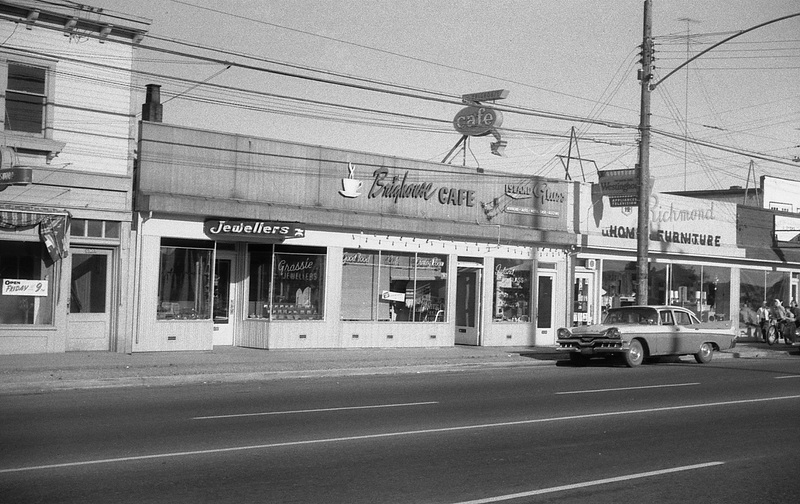 Beside the cafe is the Farmerette Grocery Store and at the end is Marpole Cleaners. Upstairs are some lawyer’s and doctor’s offices and some apartments. 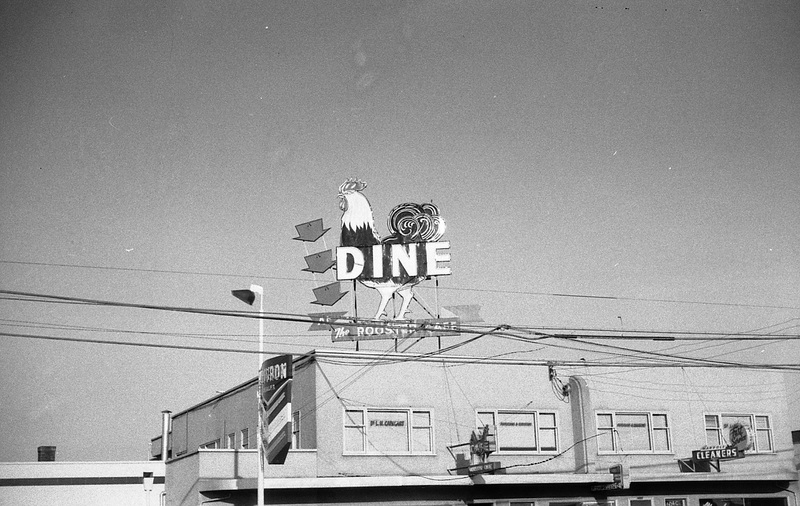 The neon sign at the Rooster Cafe. City of Richmond Archives photograph 1988 18 32. Looking up, the neon sign at the Rooster Cafe is Richmond’s finest. The Lulu Theatre. City of Richmond Archives photograph 1988 18 31. 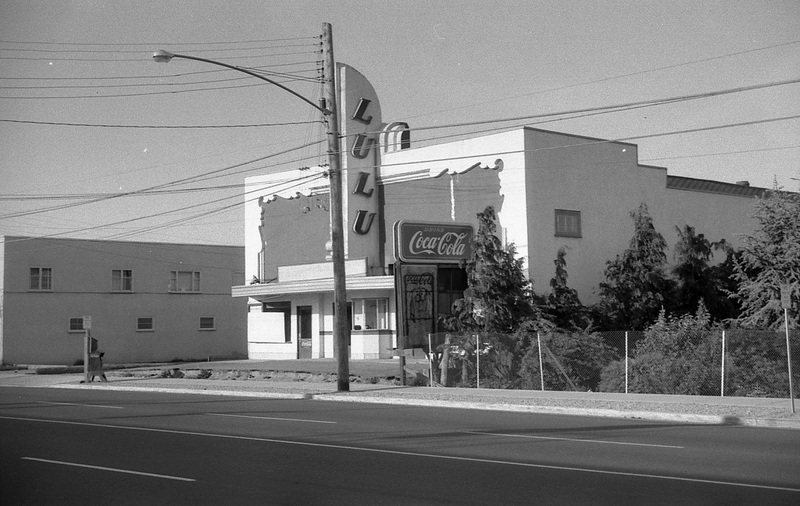 Across a driveway, the next building is the Lulu Theatre, showing Hollywood’s latest movies. Looking north down No. 3 Road toward Westminster Highway. City of Richmond Archives photograph 1988 18 4. Turning around and looking north down the west side of the street you can see the buildings housing The Canadian Bank of Commerce, Kleven’s 5-10-15 Cent Store, Pemberton Jewelers, Lansdowne Hardware (selling Bapco Paints), McCue Drugs, the Island Colour Bar (selling Canada Paints) and Richmond Tailors. Looking south west toward 621 No. 3 Road. City of Richmond Archives photograph 1988 18 5. 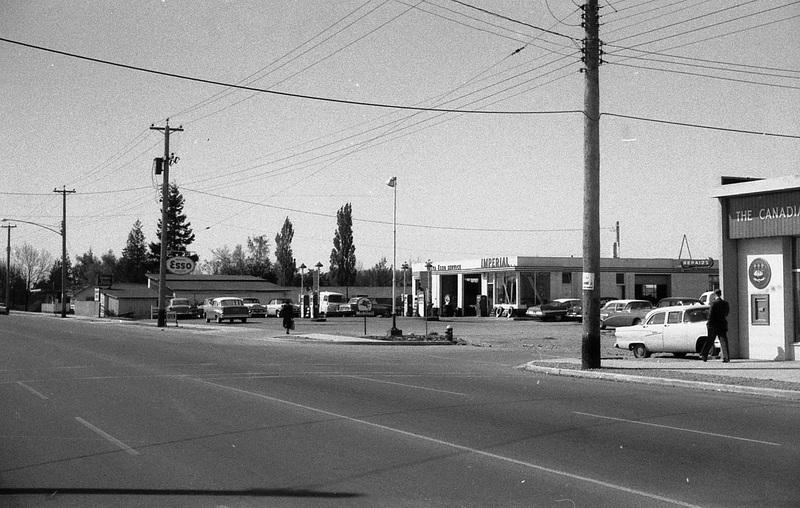 Turning and looking south west, next door to the bank is the Delta Esso Service Station. In the background are the buildings at Cunningham Lumber Co.
Back on the east side of the street is Lang’s Nurseries. City of Richmond Archives photograph 1988 18 30. 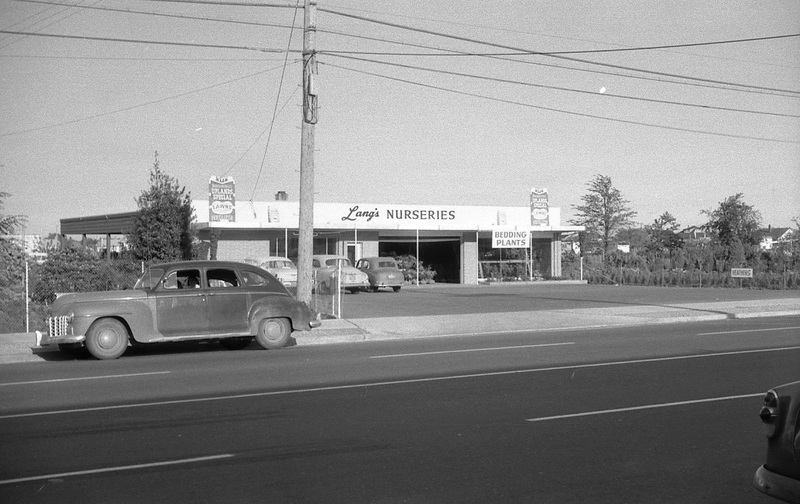 Looking back to the east side of the street we find a long-time family owned Richmond business, Lang’s Nurseries. The propery is filled with trees, shrubs, plants, topsoil and anything else one needs for landscaping or gardening. Looking north west. 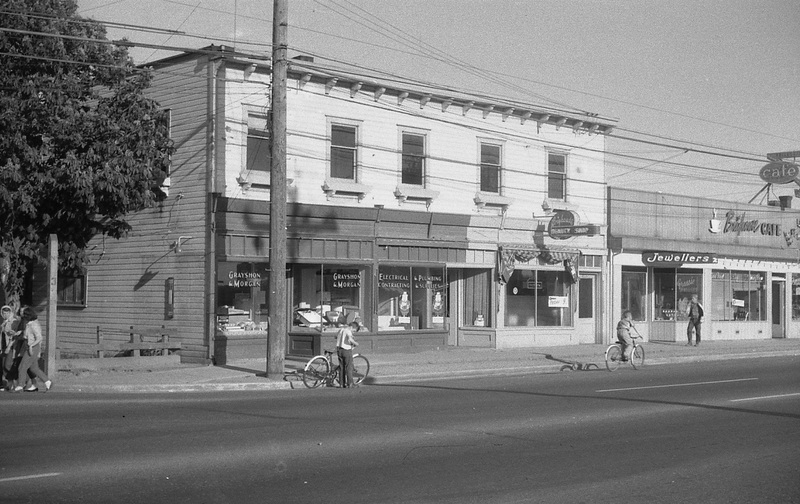 City of Richmond Archives photograph 1988 18 3. Back across the street is the Cunningham Lumber Co. (selling Glidden Paint) and the offices of J.M. Wells Construction Ltd. Looking north east toward the Bank of Montreal. City of Richmond Archives photograph 1988 18 29. Back on the east side of the street again is the Bank of Montreal at the west end of the Hyland Park Shopping Centre. 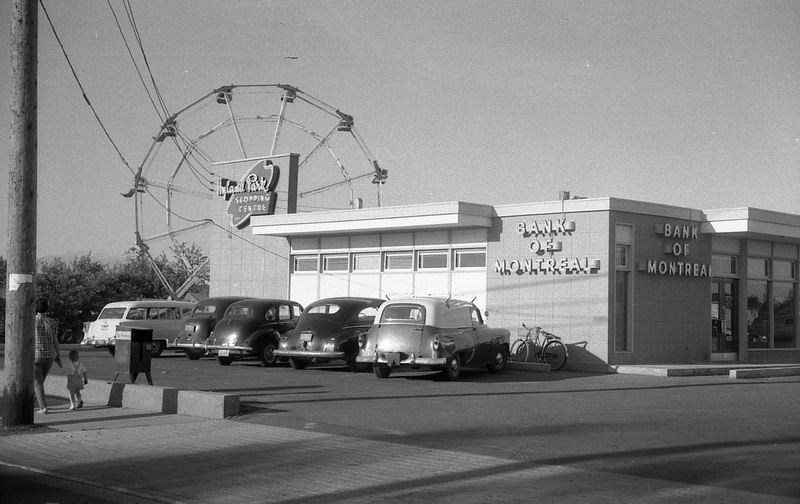 In the background, a ferris wheel from Royal Canadian Shows is set up in the empty lot between Lang’s Nurseries and Hyland Park. Looking south along No. 3 Road. City of Richmond Archives photograph 1988 18 28. 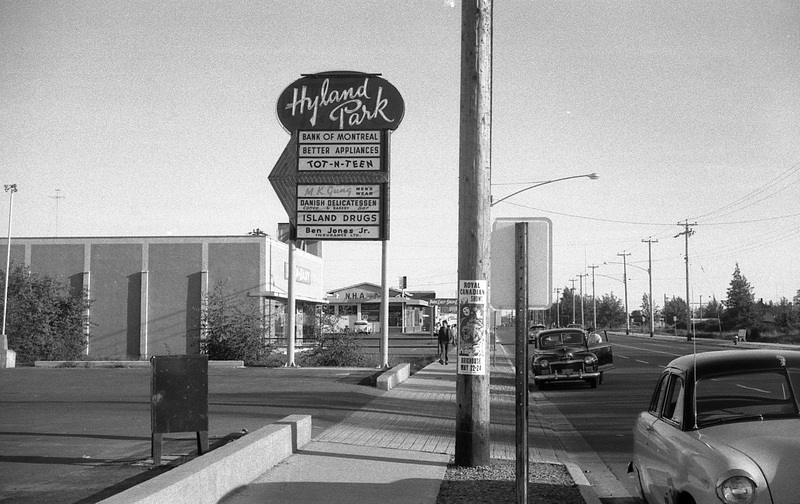 Turning south, we can see the sign for the Hyland Park Shopping Centre with a list of the businesses there. The Shop-Easy Grocery Store and its parking lot are just past the sign. Fastened to the telephone pole is a poster for Royal Canadian Shows at Brighouse May 22 to 24. Looking north on No. 3 Road. City of Richmond Archives photograph 1988 18 27. After walking along the street, crossing Cook Road and looking back, we can see the Hyland Park and Shop-Easy signs in the distance. Realtors Insurance and Home Builders Lumber (selling Monamel paint) are to the right. Simpsons-Sears Catalog Store. City of Richmond Archives photograph 1988 18 26. Between Home Builders Lumber and this building is a large, mostly empty lot. This commercial building houses four businesses. Loreta Beauty Salon is in the ground floor left, Simpsons-Sears Catalog Store is on the ground floor right, P.A. 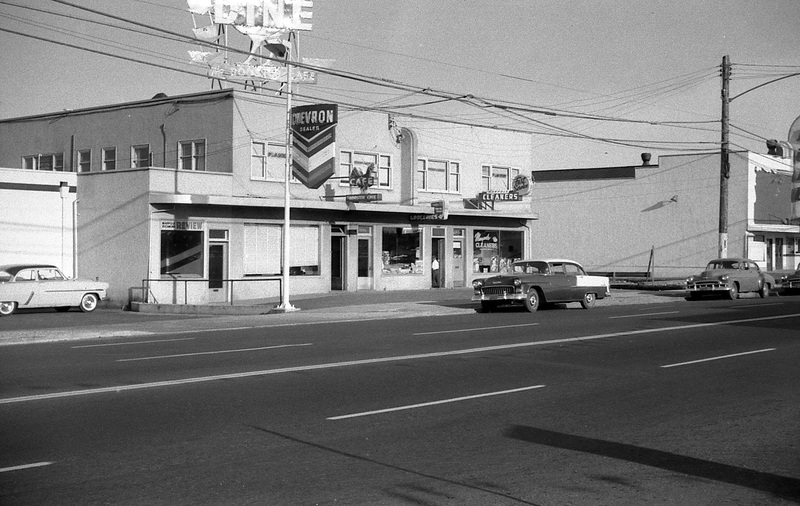 Wolanski Accountant is upstairs on the left and the Marpole-Richmond Accordion College is upstairs on the right. The east side of No. 3 Road. City of Richmond Archives photograph 1988 18 24. Looking east to the corner of Park Road and No. 3 Road. City of Richmond Archives photograph 1988 18 25. Crossing the intersection of Park and No. 3 Roads we come to Richmond Motors, a BA service station. Behind the station on Park Road is the office of Richmond Cabs (Call CR-8-8444). Looking east toward 680 No. 3 Road. City of Richmond Archives photograph 1988 18 23. Next to Richmond Motors the building at 680 No. 3 Road houses two businesses. 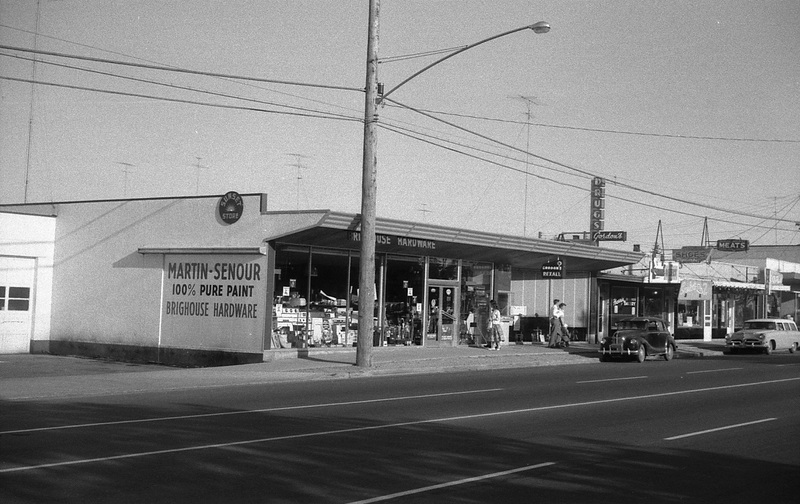 Brighouse Hardware (selling Martin-Senour Paint) and Gordon’s Rexall Drugs. Looking east toward 682 No. 3 Road. City of Richmond Archives photograph 1988 18 22. Beside the drug store, 682 No. 3 Road has four more retail outlets. Starting at the north end is Harris’ Bakery, Scoular’s Shoe Store, the Island Meat Market (Percy and Bob Eeles, proprietors) and Ivan’s Men’s Wear. Looking east toward 684 No. 3 Road. City of Richmond Archives photograph 1988 18 21. Four more businesses occupy 684 No. 3 Road. Brighouse Television sells TVs, radios and appliances as well as doing service and TV antenna installations. Next door, Burrows Cleaners provides laundry service, including pick-up and delivery. Dawn Marie Style Shop offers the latest fashions for ladies and they can go next door to shop for shoes to go with their new dress at Skuse’s Shoes. The small building next door at 686 No. 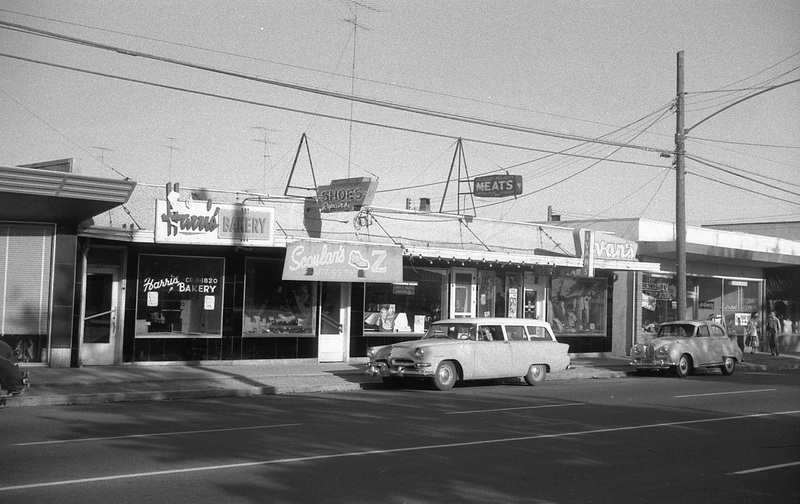 3 Road (Behind the big Cadillac) is Dr. Booth’s Dentist Office and Dr. Talmey’s and Dr. Varley’s doctor’s office. Looking east toward 688 No. 3 Road. City of Richmond Archives photograph 1988 18 20. Just south of the doctor’s offices is a large two-storey commercial building at the corner of Anderson Road and No. 3 Road. The first space is occupied by Richmond Realty with its clock sign and marquee which asks, “What Recession?”. Next to it is the Sea-View Bakery. Beside the bakery, a door leads to stairs to the second floor where Dr. Kita has his dental office, Dr. Fagen has his medical practice and where chartered accountant Donald Ross, and lawyers A.A. McDonald and F.R. Spry have their offices. At street level, the south corner of the building houses Porter’s Brighouse Pharmacy. Looking south east toward 690 No. 3 Road. City of Richmond Archives photograph 1988 18 19. Across Anderson Road is an old wood framed commercial building holding the storefront of Grayshon & Morgan Electrical Contracting and Plumbing Services. Next door is the Brighouse Beauty Shop, open Friday ’til 9:00 PM. Looking east across toward 692 No. 3 Road. City of Richmond Archives photograph 1988 18 18. Next to the beauty parlour at 692 No. 3 Road is Grassie Jewellers and next to that is a Richmond favorite, the Brighouse Cafe, offering “Good Food” in their Cafe and Dining Room. Next door is Island Glass who deal in “Glass of all kinds, for every purpose”, Lyall Grath, proprietor. Looking east toward 694 No. 3 Road. City of Richmond Archives photograph 1988 18 17. At 694 No. 3 Road we find Richmond Home Furniture, a large furniture store offering trade-ins and good deals on all kinds of furniture and flooring. Next door is a two in one business, Naimark’s Dry Goods sells “Ladies and Kiddies Wear” and in the same store, Naimark’s Dry Cleaning cleans them. Looking east toward 696 No. 3 Road. City of Richmond Archives photograph 1988 18 16. 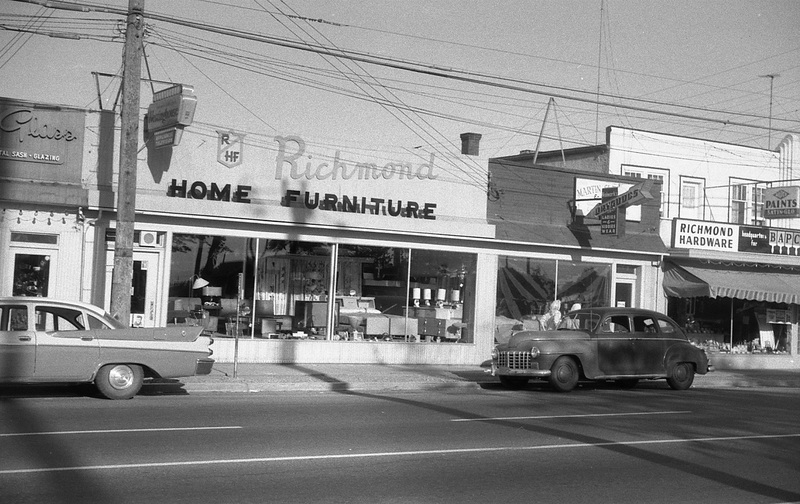 The last building before Granville Avenue is the location of Richmond Hardware and the Brighouse Grocery – Red & White Store. The hardware store sells Bapco Paint, it seems like a lot of places sell paint on No. 3 Road. 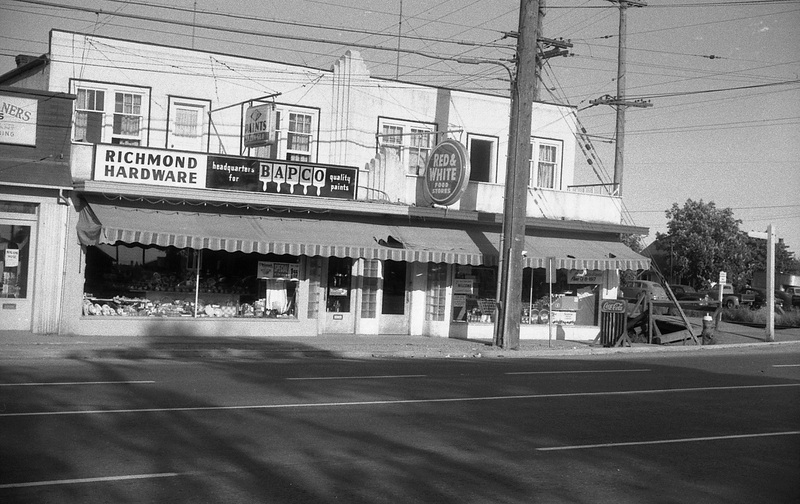 The grocery store was a longtime business in Richmond, run by the Meyer Family. Upstairs, two apartments enjoy a balcony overlooking the street. Just across the street from this location is the Richmond Town Hall and just around the corner behind the store is Brighouse Station of the recently closed BC Electric Railway Interurban Tram. Looking east toward 700 No. 3 Road. City of Richmond Archives photograph 1988 18 15. We’ll finish our walk down No. 3 Road by looking across Granville Avenue and No. 3 Road at the Parkview Service Garage. Brighouse Park is to the west of it and to the south is mostly houses. No. 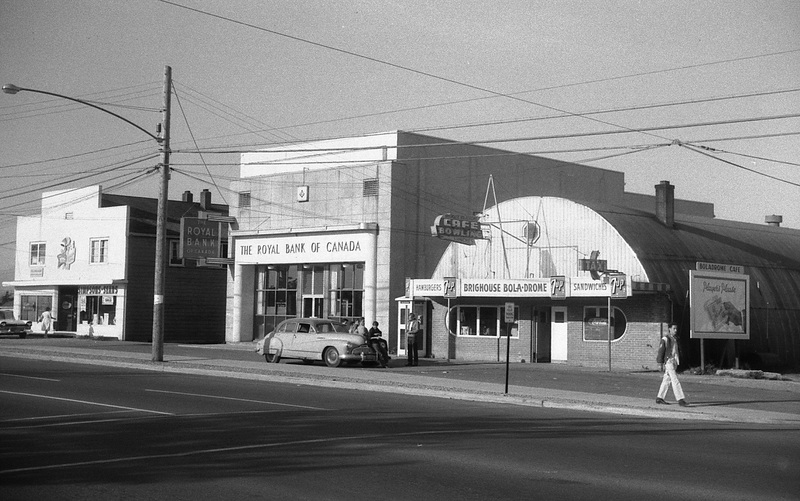 3 Road between Westminster Highway and Granville offered most of the services anyone might need during the 1950s all contained within a few blocks. 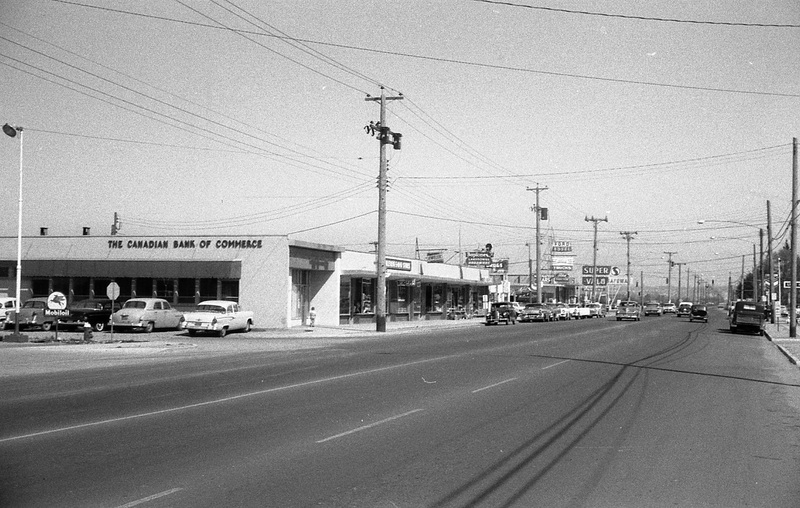 We’re fortunate that an unknown tax assessor decided to document this area and leave us with this detailed example of a point in time of Richmond’s development.